Let me start by thanking everyone for all of the supportive comments from 'Day 5: You Invited Me to This Party'. I appreciate it. You might notice that this Day 6 post is actually coming on the morning of Day 7. Well, I set out to enable the Unity interface in Ubuntu Linux, and by the time I got it worked out it was too late for me to type straight. What is Unity? That is hard to define. It is a project. It is a collection of tools and technologies. 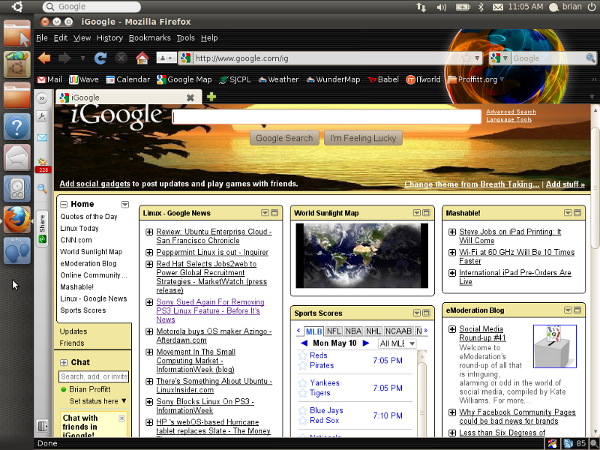 For my purposes, Unity is a more elegant interface for working with Ubuntu Linux. Unity moves the application buttons to the left of the screen with functionality that is familiar to me from the Windows 7 task bar. Unity also includes technologies like Application Indicators, System Indicators, touchscreen capabilities, and Notify OSD to streamline interaction with the OS. The Unity interface for Ubuntu has a variety of tools to streamline the Linux experience. The problem is that Unity demands more advanced graphics, and that using Ubuntu Linux on top of Window 7 with the Wubi installer apparently does not provide the proper access to the video drivers for it to work. The Nvidia GeForce 8400M GS graphics card in my Dell XPS M1330 should suffice, but unfortunately not the way I was using Ubuntu. Well, I have had a number of comments suggesting that I try Ubuntu in a more native form rather than on top of Windows, and I wanted to see what Unity is all about, so I decided to try running Ubuntu from a USB hard drive. The Ubuntu site does a pretty good job of hand-holding, and walking through the steps involved in the different installations. I downloaded the full ISO file for Ubuntu Linux 11.04 (32-bit). I clicked the radio buttons indicating that I wanted to install Ubuntu to a USB drive using Windows, and I was directed to use a tool called the Universal USB Installer. The whole process worked quite smoothly, and now instead of booting into the Wubi install of Ubuntu, I was able to boot straight into Ubuntu Linux from the USB hard drive (note: I did have to go into the BIOS settings for my laptop and make sure it was set to boot from USB ahead of the local hard drive). Unfortunately, this install method was also apparently not native enough to run Unity. No worries. I decided to go a step farther and just free up a partition on my hard drive so I could just install Ubuntu Linux in a dual-boot configuration. That process took much longer than I had anticipated, but I am not sure offhand if the issue was Windows 7, or something unique to me. But, eventually, I had a 50GB partition set aside to install Ubuntu Linux. I extracted the ISO file into a folder on my Windows 7 desktop using Winzip to see about installing it. As a Windows user, I was hoping to find the obligatory Setup.exe file, but no such luck. The only executable files I found were Wubi.exe, and USB-Creator.exe. So, instead I booted back to my USB drive install of Ubuntu Linux, because I remembered seeing an option to install Ubuntu from there.